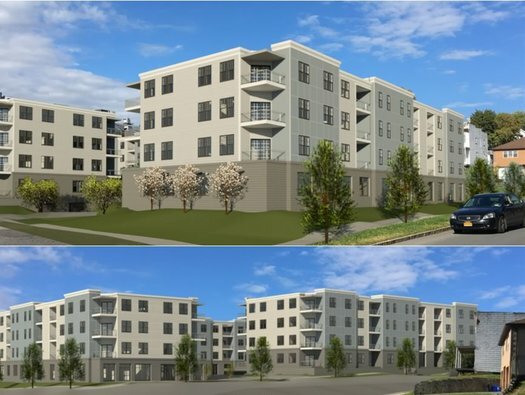 Developer Ryan Jankow's bid to redevelop the site of the Playdium bowling alley in Pine Hills into three new residential buildings was back before the board for the second month in a row -- with some some significant stylistic changes. The project's representatives -- which includes real estate agent David Pfaff, engineer Daniel Hershberg, and architect Daniel Sanders -- showed off a new, more modern exterior for the buildings. The mansard roofs of the original design have been replaced with flat roofs, and glass railings were added to the balconies. The design also includes new streetside entrances for each of the three buildings. 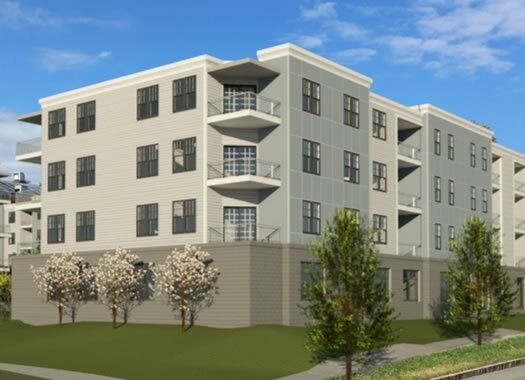 The roofline change for the four-story buildings brings the overall height down 6-8 feet, but it also allows the addition of a few more units on the top floor. The overall number of apartments in the project increased from 106 to 110. The plan continues to include a cafe/coffee shop with patio in the corner of the building that faces Ontario Street, along with a laundromat and multi-purpose space. As was the case last month, the project again prompted multiple comments from the public skeptical about the development's impacts on traffic, parking, and sewer infrastructure in the neighborhood. Common Council member Judy Doesschate was also back to comment on the height of the buildings and how they fit into the context of the neighborhood, which is mostly 1- and 2-story buildings. She wasn't sold on the new renderings presented. "The pictures that they show don't adequately show the topography around this development," she said. The project wasn't up for a vote Thursday by the planning board -- that could come next month. But a key date to keep an eye on right now is the Board of Zoning Appeals meeting on October 25. The project goes before the BZA for a variance allowing it to be 4 stories in a zone where the limit is 3.5 stories. Thursday was the first time before the board for the project at 526 Central Ave, the former site of an Albany Police Department building. It was sold to Capitalize Albany in 2011. The Regan Development Corporation is now proposing the construction of a 5-story, 118,000-square-foot building there that would include about 5,000 square feet of street level retail space, roughly 17,000 square feet of office space, 71 residential units, and 126 parking spaces behind the building. Projected cost of the project is $20 million. Project architect Matthew Meier of HHL Architects mentioned during his presentation that Whitney Young Health would be occupying some of the space in the building. + The arrangement of parking and green space behind the building, and whether pushing the parking farther back on the site so additional green space could be added right behind the building would negatively affect a buffer between the site and neighbors behind it. + How a driveway along the southern edge of the site will work with the Albany School District's adjacent Abrookin Career and Technical Center. Two projects attracted the majority of public feedback Thursday -- the Playdium redevelopment, and 30 Pine Lane, which is off Rapp Road and Washington Ave Extension. The Cardona Development Group wants to demolish a single-family home there so a new, 24-unit apartment building with garages can be built. The project prompted multiple comments in opposition from residents of nearby condos developments. They told the board they believed that Pine Lane is already under significant stress from its current traffic level, and conditions there are unsafe. Lawrence D'Arco -- president of the board of directors of the Village in the Green Condominiums, a 96-unit development there -- described Pine Lane as the most dangerous street in the city. And other residents described that entire section of Washington Ave Extension as generally unsafe because of speeding and the lack of pedestrian amenities. A few of the residents also said in their comments that they would lament the reduction in green space, and they were worried about how the addition of apartments to the area would affect their property values. Much of the discussion with the board revolved around what sounds like an unusual situation with roots in the past. The project's engineer, Daniel Hershberg, told the board that, according to the lines laid out in property deeds, the city may not technically own the street because the property lines extend to the midpoint of the road. Board chair Al DeSalvo noted this project would come before the board at least two more times, and it looks like it will continue to be a hot topic. One more thing about this project: Hershberg said if the project goes through, the new owners plan to donate about a third of the property to the Albany Pine Bush Preserve because the property currently serves as a corridor connecting two colonies of Karner Blue butterflies. 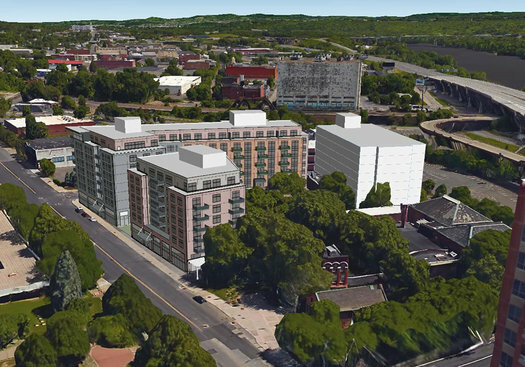 The big mixed-use project proposed for 705 Broadway, the site just north of Quackenbush Square downtown, was back before the board after many months. The project includes three buildings -- two mixed-use residential buildings with roughly 180 apartment units, and the third a 136-room hotel. There wasn't much new to report. The project was back up so the planning board could be declared the lead agency for State Environmental Quality Review Act purposes. As board chair Al DeSalvo noted, there are still many technical details to be worked out on the project. John O'Brien, chief development officer of the Pioneer Companies, did give a short explanation of the work currently going on at the site. It's remediation of the brownfield soil there. He said it was a bit behind schedule because of equipment problems. The second phase of the redevelopment of the Ida Yarborough Homes in Arbor Hill was back before the board for the final time. 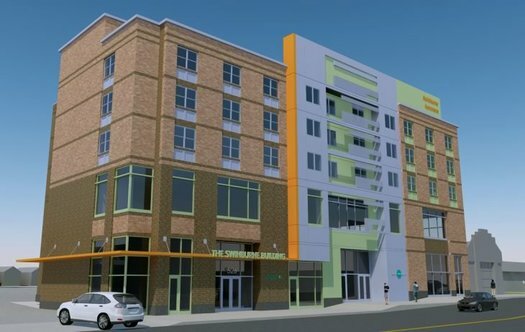 The project includes two buildings with 72 units set aside for a range of different incomes, some all the way up to 90 percent of the area median income. The project had been waiting on a handful of technical reviews. With those squared away, the board voted unanimously to approve its development plan. 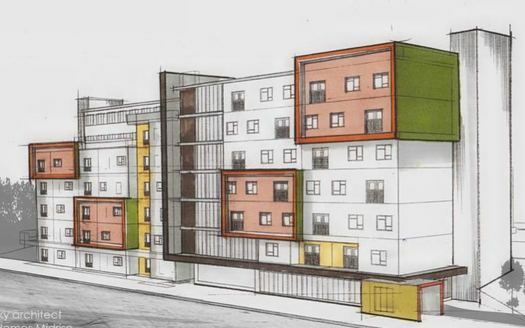 Leif Engstrom, the Albany Housing Authority's director of development, said after the vote that AHA is aiming to start construction on phase two in February and demolition could start before that. The proposal to redevelop the former Howard Johnson's / tennis club property at Southern Boulevard and Mt. Hope Drive was back before the board for a second time. 351 Diamond Development, LLC is proposing five structures at the site: a 105-room hotel, a gas station/car wash, a stand-alone drive-thru restaurant, and a three-space retail building also with a drive-thru. Former Albany Common Council member Dominick Calsolaro was the lone public comment on this project. He said he wanted to make sure that there was some sort of assurance the new roadway -- which would be privately owned, but function effectively as a public road -- would continue to be open to through traffic into the future. + The board extended the project approval for the conversion of 4 Central Ave into 35 residential units and 3,000 square feet of street level retail. Nadine Shadlock -- representing West Mall Office Center, LLC -- said the project had been held up because of complications in getting state and federal historic tax credits. But she said the owners are working toward getting the building listed on the National Register, which should help smooth the way. + The board granted conditional demolition approval for a home at 197 Holmes Dale in the Buckingham Pond neighborhood. Applicant Amarit Rosin is planning to build a new home on the property. Public comment consisted of one neighbor speaking in favor of the plan. The demolition approval is contingent on the filing for a building permit for the new home. + The board also granted a conditional use permit for the space next to The Spectrum on Delaware Ave to be used as a bar. Here are more bits about that project. 30 Pine Lane - The statement that 1/3 of the parcel would be designated green space for the sake of the karner blue butterfly is laughable. The proposal to replace 1 home with a 25 unit apt & parking would destroy corridor habitat for this federally endangered butterfly. First, make sure all the renovations and new constructions are brought into full compliance with the ADA and the accessibility provisions of the New York State building code. Accessible housing at all market levels is extremely scarce. And make sure all front entrances and common areas are accessible â€“ inaccessible front entrances and separate designated side entrances is discrimination and illegal under the ADA. It is understandable why the city is serious about aesthetics and increasing available and attractive housing. When the population fell below 100,000, we were recategorized by the federal government and receive less financial aid as a result. Besides, nobody wants to be unwanted. A city always wants to be attractive. It wants people to want to be here. It wants people to want to live here. It wants vibrancy. It wants growth. All of this, ALL of it, sounds positive and exciting. Chilling how much resistance to change is out there! None of these projects are "cutting edge", yet they are greeted as if they were experimental or dangerous developments. The region just has to move beyond defining the 2 family home and the 6 unit brick apt building as the apex of development. Hopefully these projects will all be built. It's crazy how anti-development and NIMBYist some people are around here, and then they wonder why so many people leave. It's fine if they build a house or move in, but then they want to close the door to everyone else. So let me get this right.....people would prefer to live in nice cities?? ?Had no idea.....ps please do ANYTHING to prevent playdium buildings from looking like the 1950â€™s Soviet Union as depicted......has anyone on the website or developing these projects ever been to or lived in any nice cities???? Had to laugh along with the frustration expressed by BS (and PK) in their Oct 22 comments....I'm pretty well convinced that the decision makers and many, many residents have NOT experienced "nice cities" or truly vibrant urban areas or traveled more than 100 miles from here (except for a ball game or a trip to Florida or Myrtle beach). I guess I never saw the renderings for 705 Broadway, but that (as well as the building proposed for the lot across from the post office annex) is going to dramatically change the character of the area. Not saying it's a bad (or good) thing, it's just going to be an interesting transformation. Albany needs to get over itself and greenlight some of these housing projects. The "Tech Valley" workers we're so desperate to attract want attractive, urban spaces. Not dilapidated post-war duplexes, we've got neighborhoods full of rotten ones already. Not ancient low rise apartment buildings. Not 30 mile commutes from some distant suburbs. They don't want highways and massive parking lots. They want functional, modern public transit. Albany, put some makeup on and maybe you'll get asked on a date. Otherwise keep sitting by the phone, I'm sure he'll call any day. Sean and jsc you are right. Sadly what you are both pointing to as the obstacle is our 19th century political leadership. If they can't control it they don't want it. Nothing has changed. @jsc: The short presentation re: Holmes Dale mentioned that the new house would be roughly the same footprint as the old one, but there wasn't much discussion beyond that. I haven't been over to see the site and its condition, but the neighbor who spoke sounded very happy that someone was doing something with the property.